One of the best things about January? For us, it's definitely that it's when we start to receive our new gowns at Little White Dress each year! 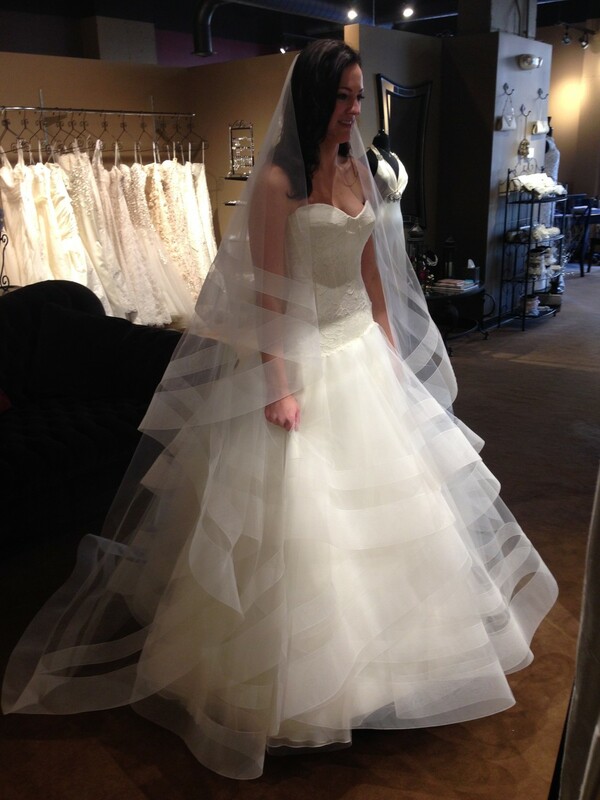 We know that Colorado brides will swoon over the new RIVINI gowns we have just received. Schedule your appointment to try on any of these gowns by calling us at 303-814-8972 or visiting www.lwdbridal.com! Meet Fabrizia, Martini, Giuliana, and Lanai! Fabrizia is a drop-waist ball gown with a soft lace corset-style bodice, delicate tulle layers, volumizing horsehair-netting hems, and a matching cathedral-length veil. This gown is absolutely gorgeous in photos and in person, and is super flattering and surprisingly wearable. Giulana is a light, romantic gown that is fitted to the hips, with a delicate illusion neckline and shoulders, feminine lace bodice, detachable bow sash, and a beautiful just-the-right-length train. Giuliana is just perfect for the bride who wants a romantic look without too many embellishments. Martini is our most fun and flirty gown at Little White Dress! In a subtle blush color, Martini's dramatic pleating, waist-cinching bustier bodice, and hi-lo hem are the ultimate youthful, high-fashion bridal style statement. Definitely for a bride who knows how to have fun (after all, she's named Martini!)! The Lanai gown is a sheath silhouette in the softest lace, with blush underlay, and a gorgeous plunging key-hole back. Lanai would look amazing at a beach wedding or a rustic mountain affair. To try on any of these gowns - and many more - schedule your appointment at Little White Dress Bridal Shop in Denver by calling us at 303-814-8972 or visiting www.lwdbridal.com!